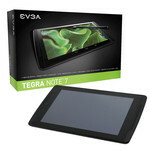 Nvidia introduces the brand-new Tegra Note 7 for a recommended retail price of 209 Euros (~$287), which is just slightly above the important 200 Euros (~$274) mark. The stylish 7-inch device is sold by Gigabyte as well as EVGA in Germany and has a lot to offer. 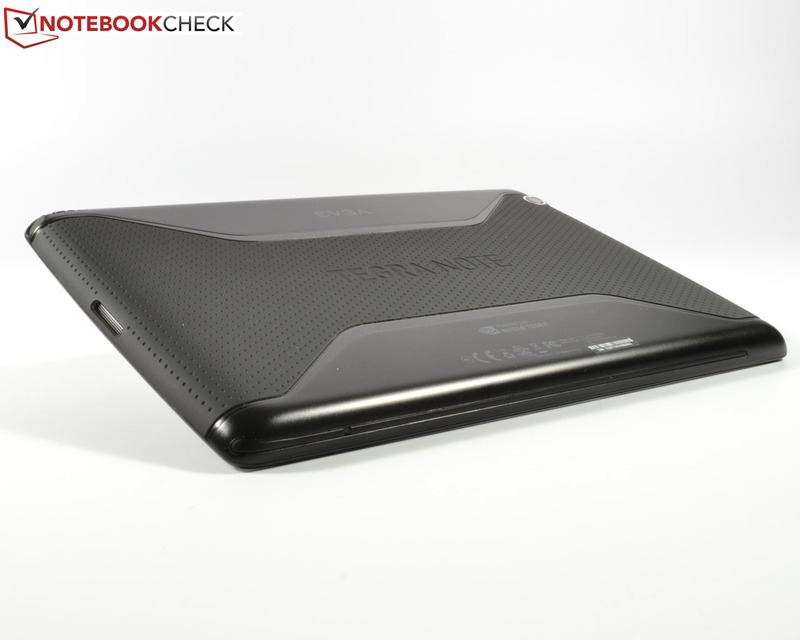 The heart of the tablet is the fast Nvidia Tegra 4 quad-core that runs at 1.8 GHz. The hardware equipment is complemented by an integrated GeForce GPU, 1 GB of memory as well as 16 GB of storage, which can be expanded by a micro SD card (up to 64 GB). 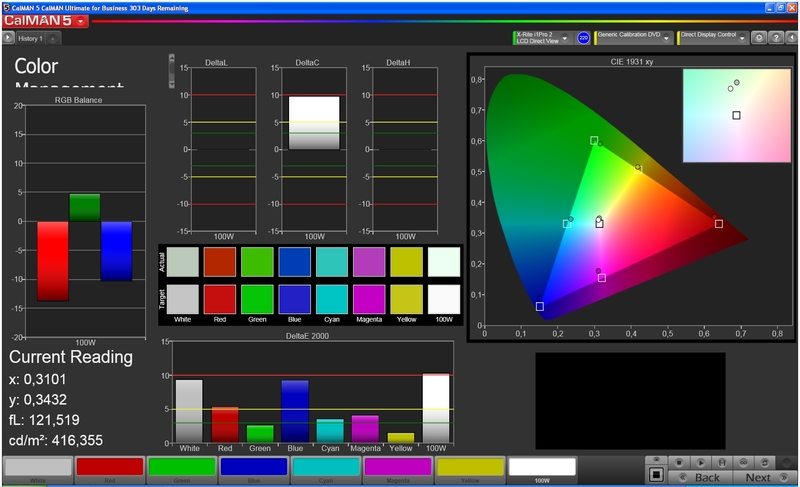 The IPS display has a resolution of 1280x800 pixels and external displays can be attached via a micro HDMI port. Stereo speakers at the front and a 5 MP camera with HDR complement the package. 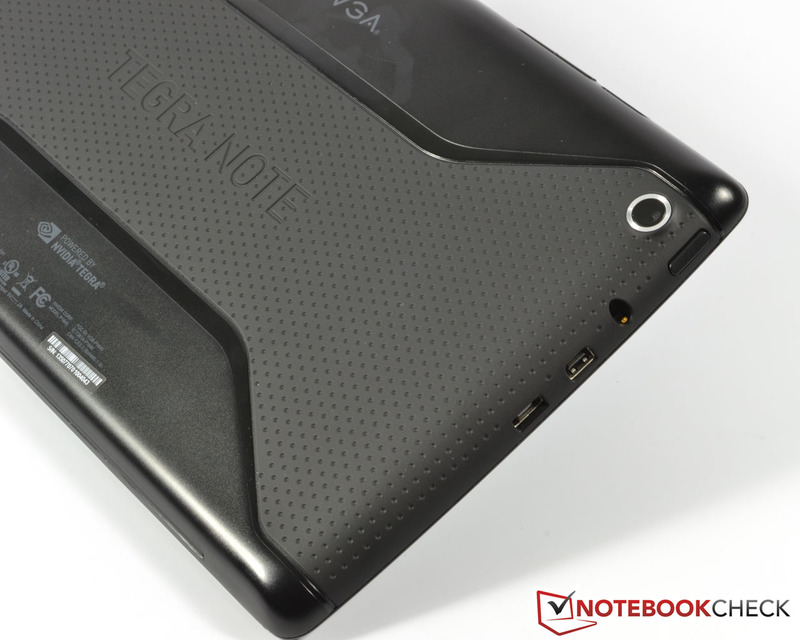 The integrated battery has a capacity of 4,100 mAh or 15.17 Wh; Nvidia also equipped the Tegra Note 7 with a so-called DirectStylus and the corresponding software. This tablet has numerous competitors, for example: Google Nexus 7 2013, HP Slate 8 Pro 7600eg, Lenovo S5000-F, Samsung Galaxy Tab 3 7.0 SM-T210 as well as the more expensive Apple iPad Mini Retina. Nvidia also introduced a configuration with LTE at the last Mobile World Congress, which should be available in the second quarter of 2014 for 299 Euros (~$410). 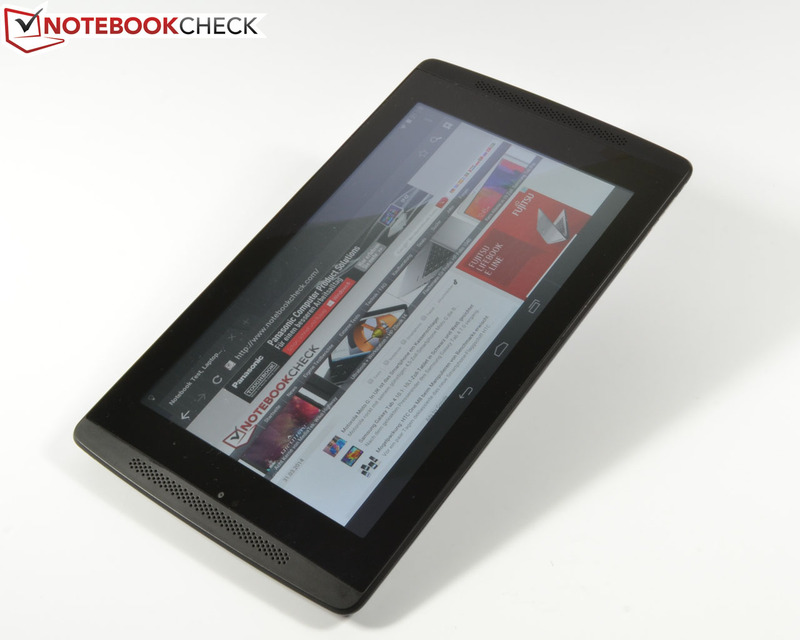 The case design of the Nvidia Tegra Note 7 is very appealing. A mixture of matte black polycarbonate with glossy black highlights as well as convenient haptics with a structured surface and rounded edges can convince us. The gaps are also very consistent. Unfortunately, our review unit has a slightly protruding and sharp ridge on one side. Otherwise, the build quality is decent. The overall chassis stability is good, although there are some slight creaking noises when you try to twist the device. 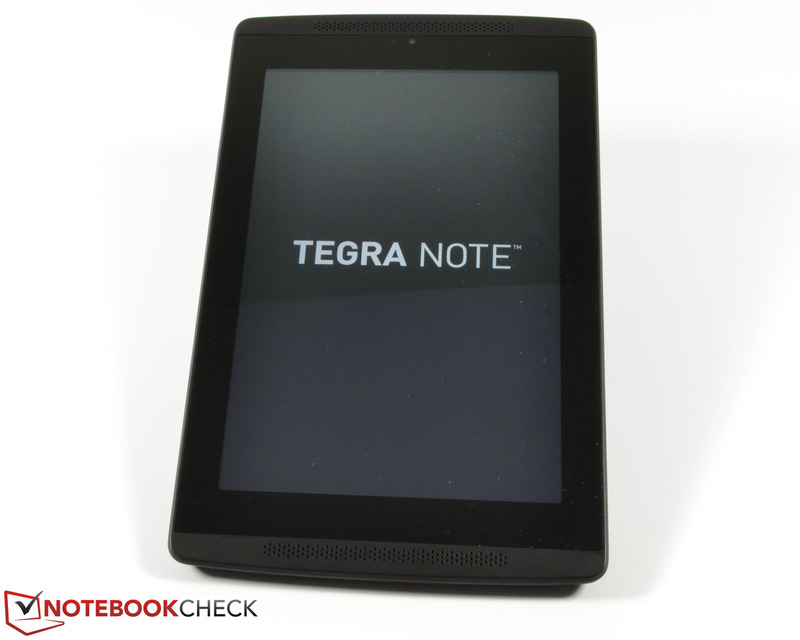 The Tegra Note 7 measures 199 x 119 x 9.6 mm (~7.8 x 4.7 x 0.4 inches), which is on the same level as the competition. The weight of 353 grams (~12.5 ounces) on the other hand is slightly higher than the rivals, but it is still okay. 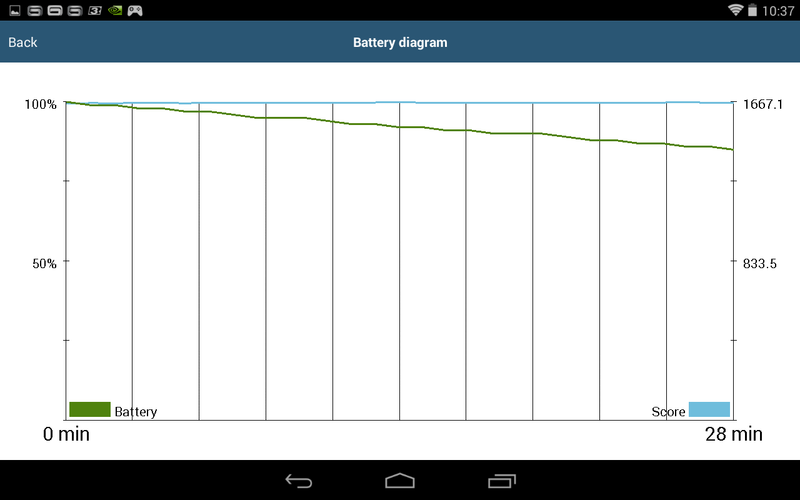 You cannot replace the battery, but this is not unusual for a tablet. Apart from the micro SD port, the user cannot upgrade anything. 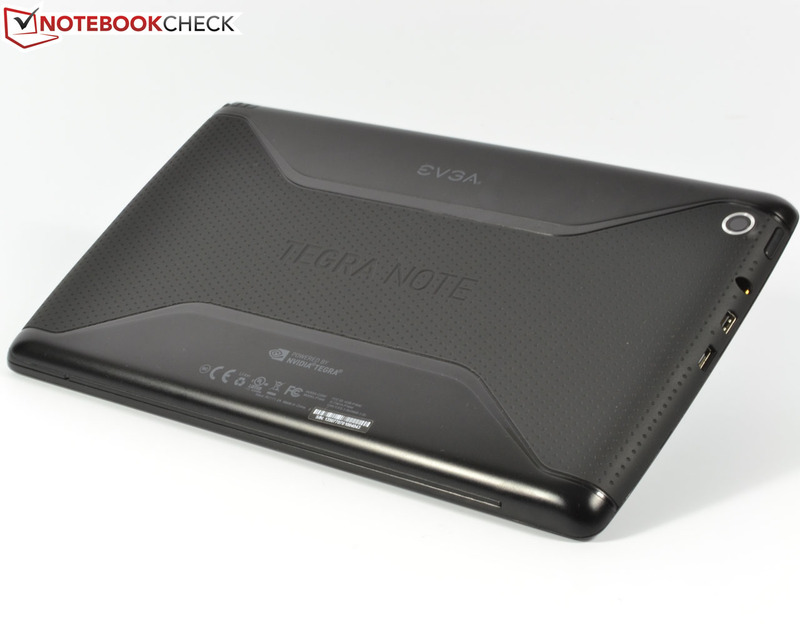 The heart of the Nvidia Tegra Note 7 is the powerful Nvidia Tegra 4 quad-core chip with a clock of 1.8 GHz, including the GeForce GPU as well as 1 GB RAM. 16 GB internal storage can be expanded by a micro SD card with a capacity of up to 64 GB. Besides the standard ports, the review unit also offers a rare micro HDMI port for external displays. The port is next to the micro USB port and the 3.5 mm stereo jack at the top of the case – the gaps between the ports are sufficiently sized and there should not be any problems with blocked connections. The physical buttons for the power and the volume rocker have a clear pressure point and provide good feedback. 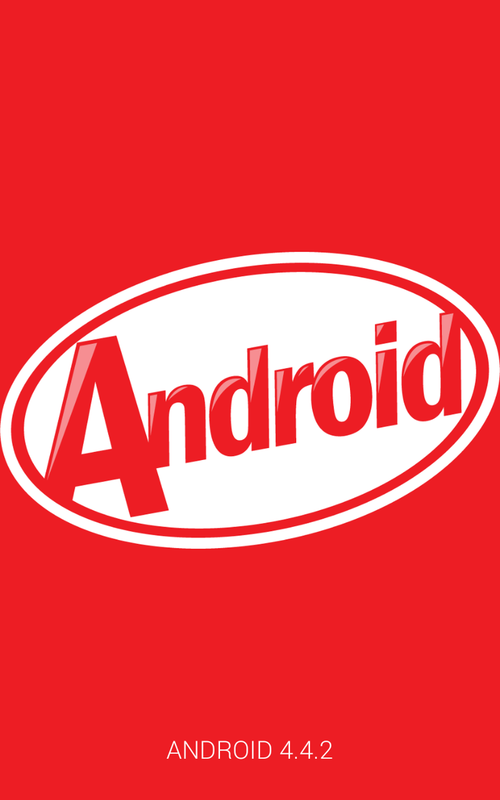 The operating system of the Nvidia Tegra Note 7 is Android 4.4.2 KitKat. 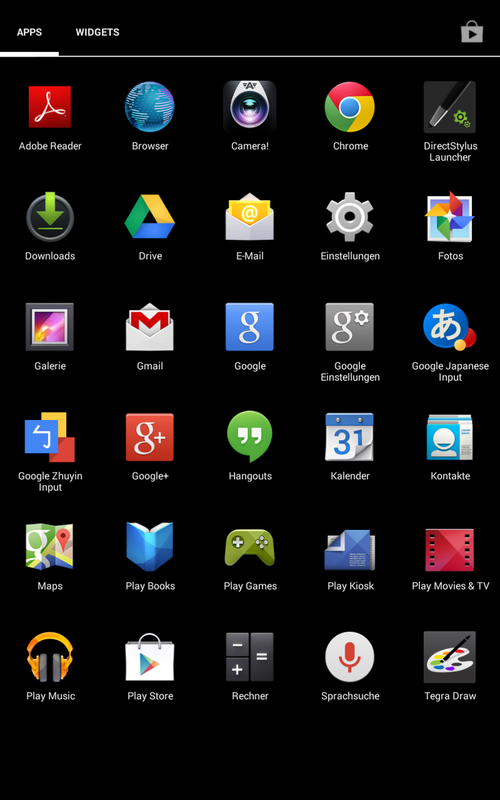 There is no customized user interface or other changes by the manufacturer, you get a stock Android OS, which is also used for the Google Nexus 7. Besides special software for the DirectStylus (Tegra Draw and Write), Nvidia also includes some useful apps, including Dropbox or TegraZone. 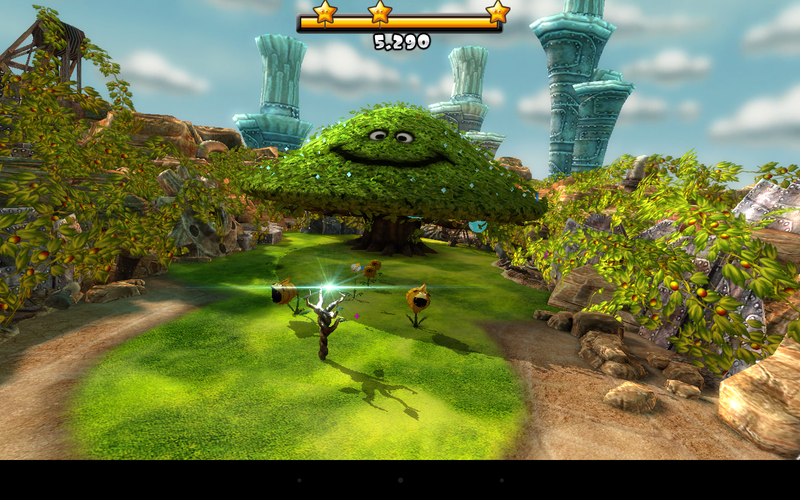 The latter is a special game hub; the amount of bloatware is limited. The Nvidia Tegra Note 7 supports the WLAN standards 802.11b/g/n, but a UMTS module is not available. 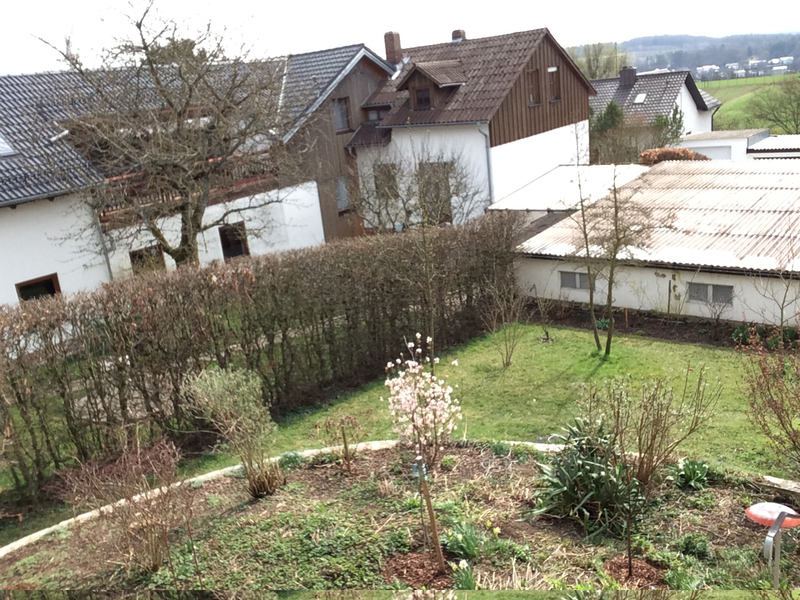 The WLAN reception is okay. 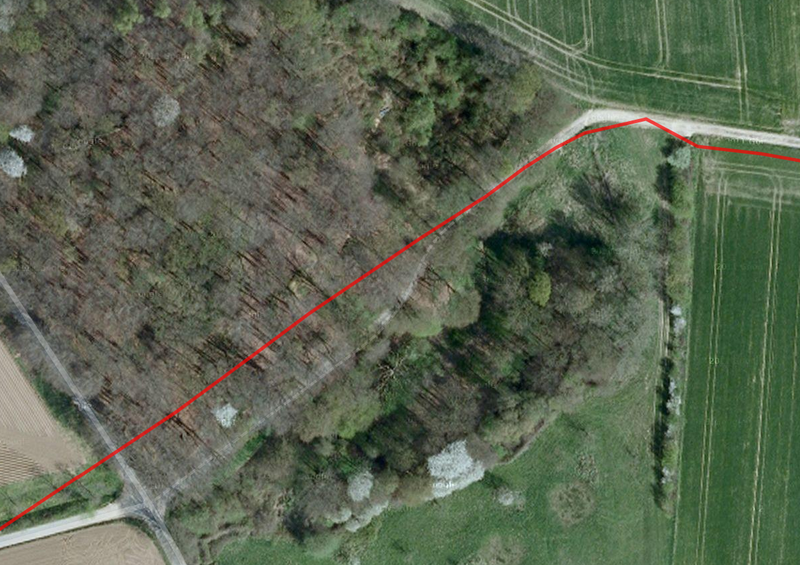 We did not have problems with sudden connection losses even through several walls and at a distance of around 10 meters (~33 feet) from the router. Apple's iPad Mini Retina, however, has a better signal quality. 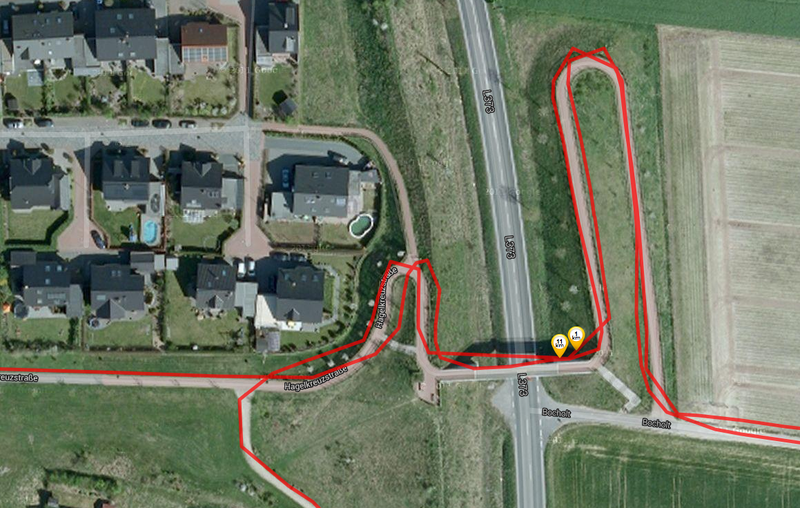 According to the app GPS Test, the integrated GPS module has good reception. 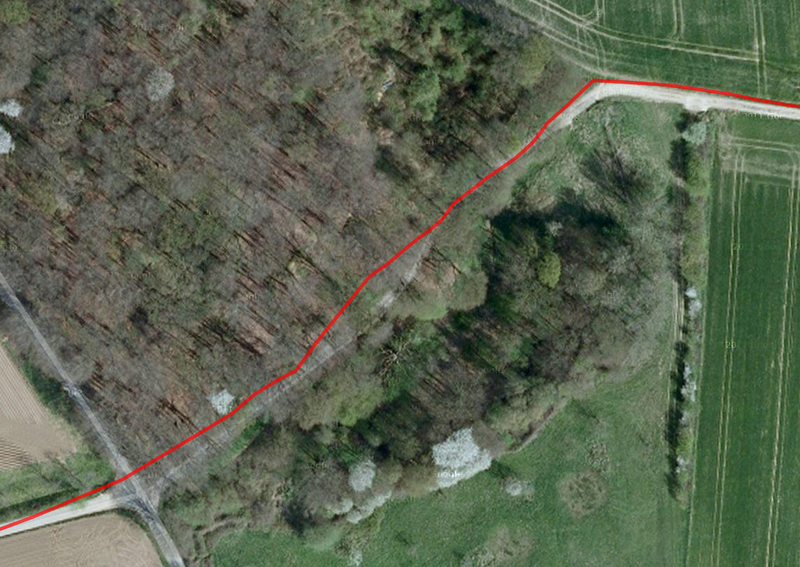 Our review unit was located within a radius of 5 meters (~16 feet), and we could even determine the position indoors. 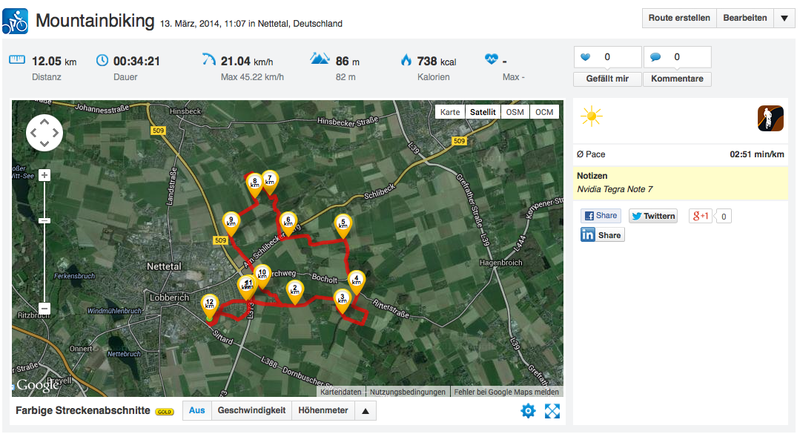 Our detailed comparison with the Garmin Edge 500 on the other hand does show some weaknesses: Small deviations in the forest and bigger problems in the area around the bridge. 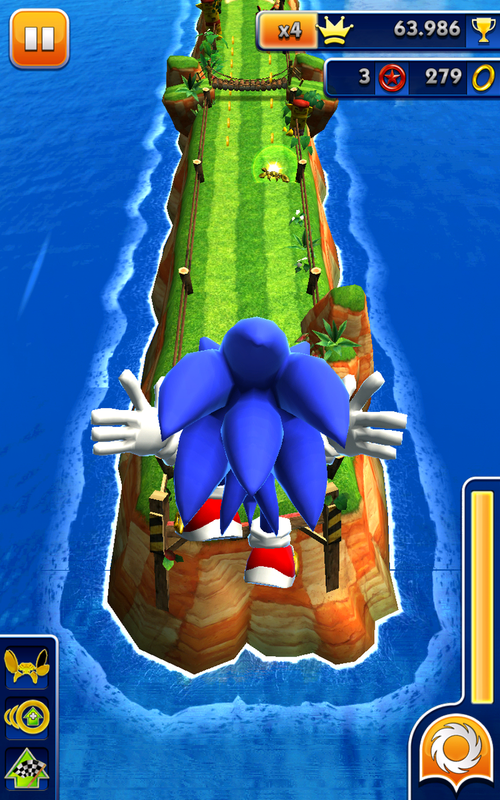 This is also the reason for the different overall distance. 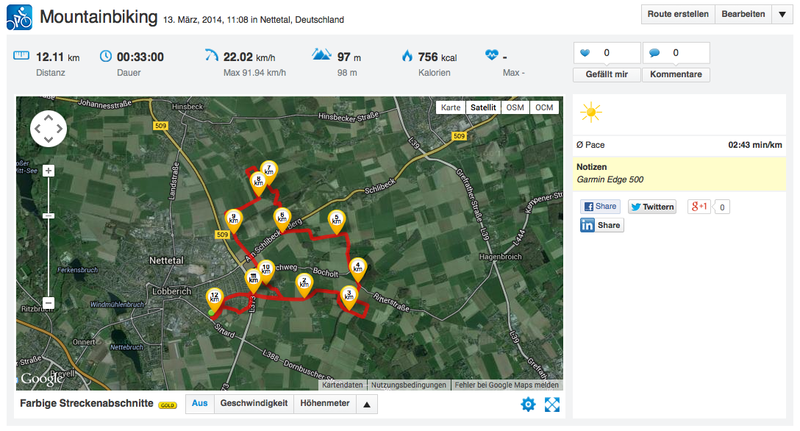 If you are not relying on the tablet for pinpoint accuracy, it works well for general navigation. The Tegra Note 7 has a VGA webcam (0.3 MP) at the front, but the quality is just sufficient for occasional video chats due to the poor quality, the significant picture noise and the distorted colors. The main camera on the other hand has a resolution of 5 MP with autofocus and HDR support. Nvidia advertises the quality with "Always On High Dynamic Range" (AOHDR), which means high details and contrast or the capability to compensate over- and underexposure similar to the human eye. Thanks to AOHDR, the camera is also supposed to avoid occasional ghosting during movements with the so-called Tap-to-Track technology, which focuses on the selected object. This much can be said right away: The camera cannot quite live up to the promises. 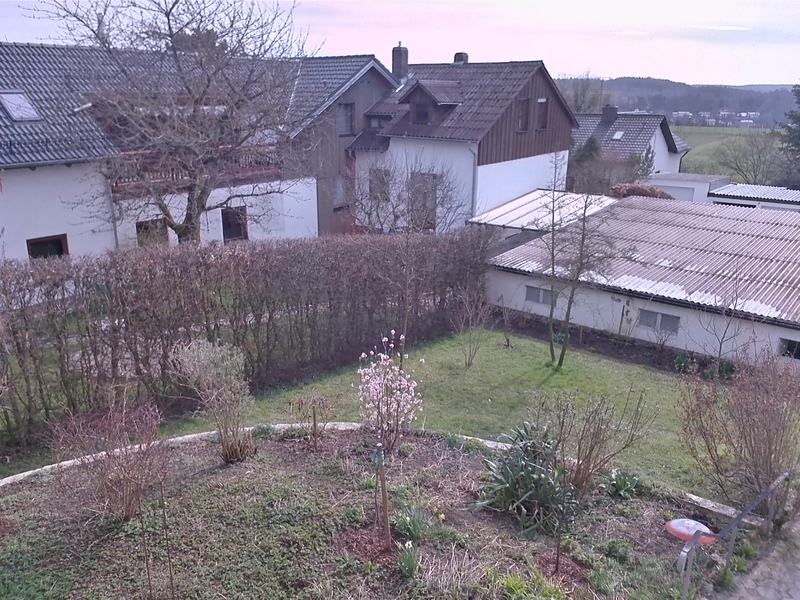 The camera app does offer several options and interesting features like slow-motion HD video with 100+ fps as well as full resolution burst photography, but the quality cannot really convince us in our practical test. Colors show deviations and a low color temperature, as you can see in the comparison pictures. The rival Apple iPad Mini Retina is pretty close to the reference camera in terms of color presentation, but the review unit, unfortunately, shows a slight overexposure. It is, however, still sufficient for occasional snapshots. The provided accessories of the Nvidia Tegra Note 7 are slightly above the usual standard: Besides the device itself, the box also contains a modular power adaptor of 5 V/2 A, the corresponding USB cable as well as the DirectStylus pen and a quick start guide. You can also get a Slide Cover for the tablet, which combines a protective cover and a stand – we are already familiar with this design from other rivals like the Apple iPad Mini Retina. The price was still unknown at the time of this review. 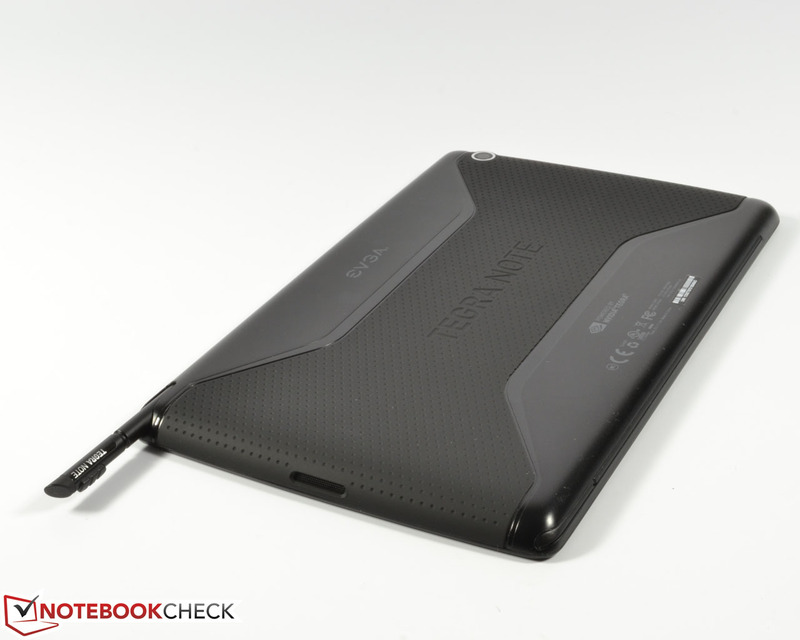 The German retailers Gigabyte and EVGA grant a warranty period of 12 months for the Tegra Note 7. An optional warranty extension is currently not available. 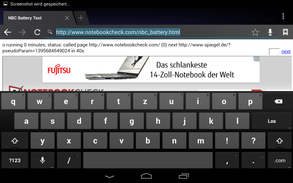 The virtual keyboard meets the usual Android standard and therefore is very intuitive and reliable. 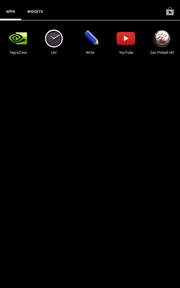 As usual, the keys and the Android navigation buttons, which can be deactivated, occupy around a third of the display in portrait mode and about 50% in landscape mode. The keyboard is still sufficiently sized to write without typos, even on the comparatively small 7-inch display. 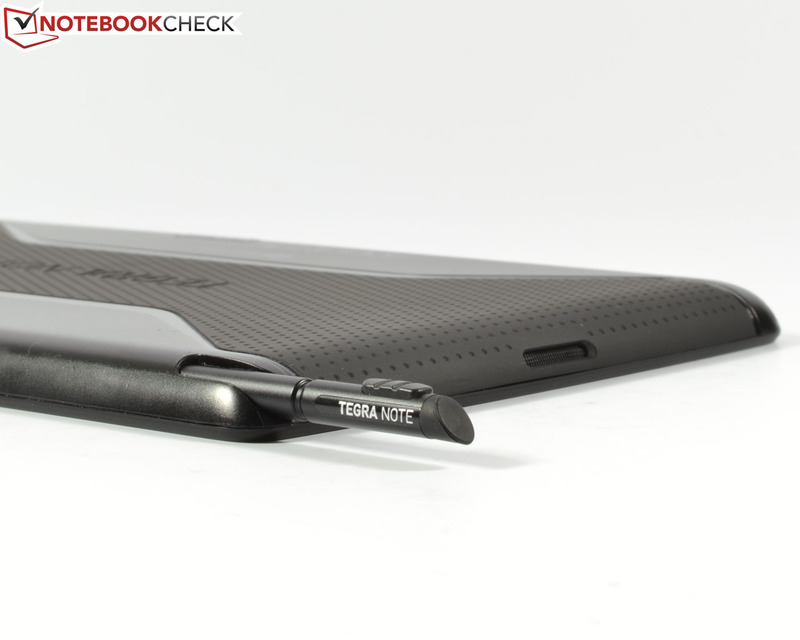 Similar to the Samsung Galaxy Note 8.0 Tablet, the Tegra Note 7 is also equipped with an input pen, in this case called DirectStylus. Just pull it out of the chassis and the device, based on your preferences, automatically starts a certain app or the DirectStylus Starter Menu, where you can organize compatible apps. 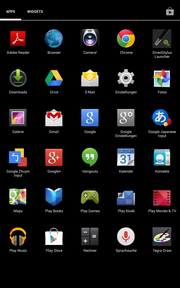 This, for instance, includes the preloaded apps Tegra Draw and Write, a drawing and writing application, respectively. 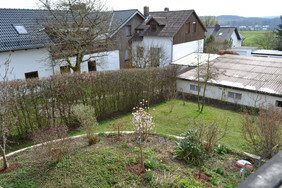 The input works pretty well after a little while and it is therefore a genuine enrichment. 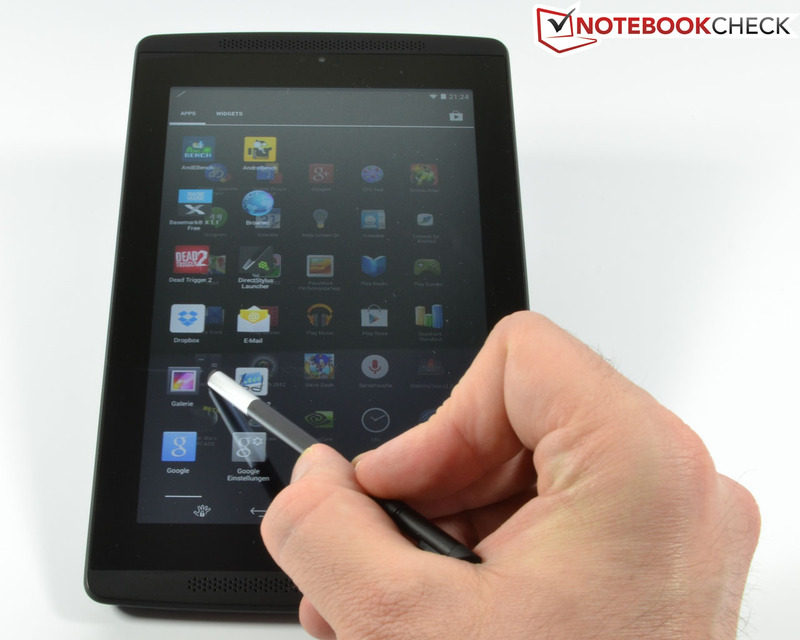 The capacitive ten-finger multi-touch screen executes inputs from the fingers and the stylus quickly and precisely. The picture rotation is also pretty quick with a delay of around one second. 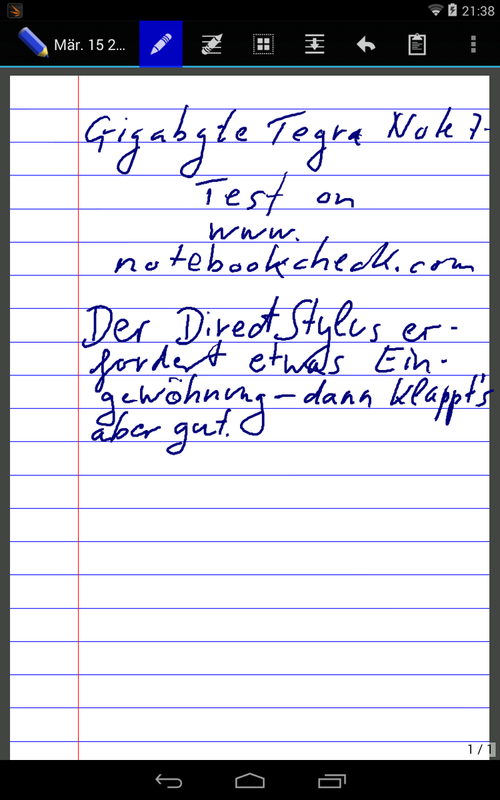 The DirectStylus is accompanied by an app for notes. 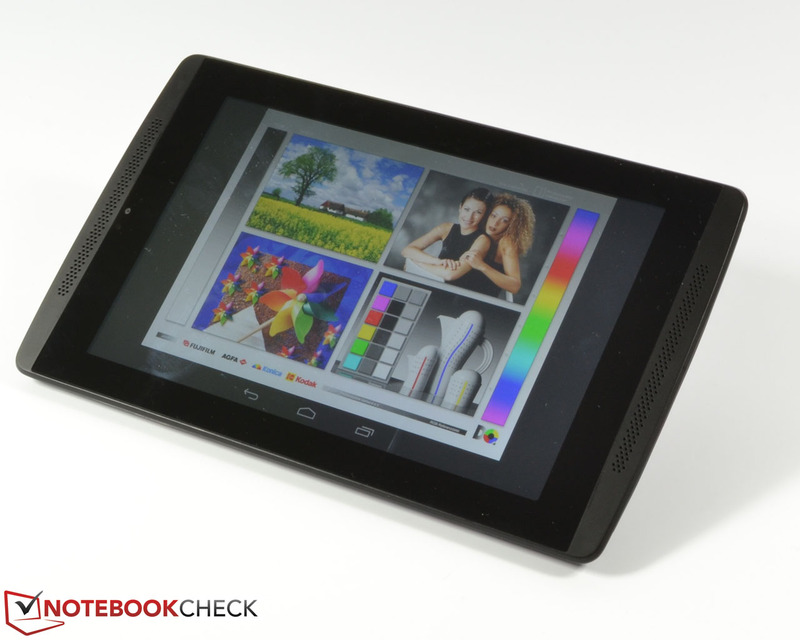 Nvidia's Tegra Note 7 has a 7-inch display with a sufficiently high resolution of 1280x800 pixels. Some rivals are superior in this area, for example the HP Slate 8 Pro 7600eg with 1600x1200, the Google Nexus 7 2013 with 1920x1200 and the Apple iPad Mini Retina with even 2048x1536 pixels. Lenovo's S5000-F has the same resolution, but the other rivals usually have fewer pixels. Samsung's Galaxy Tab 3 7.0 SM-T210, for instance, only has 1024x600 pixels. 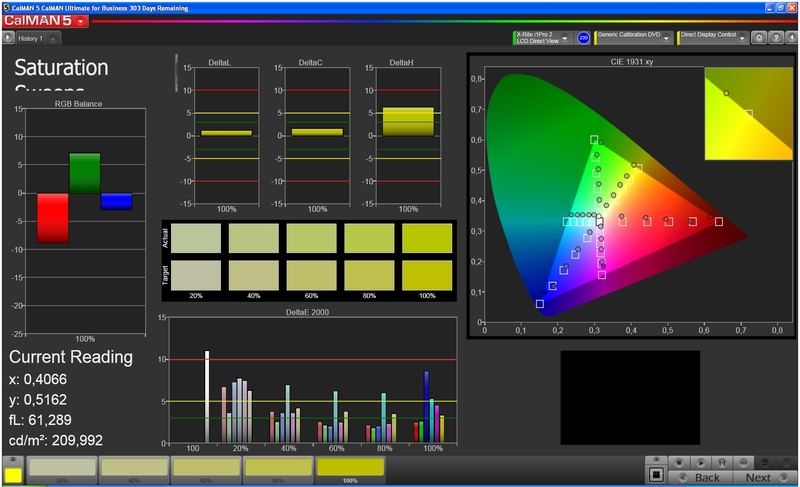 An average brightness of 396.8 cd/m² for the IPS display is very high, but the brightness distribution of 84% could be better. However, the latter is not noticeable in practice; even a plain white background does not reveal any weaknesses. The comparison also shows that the performance of the review unit is decent. 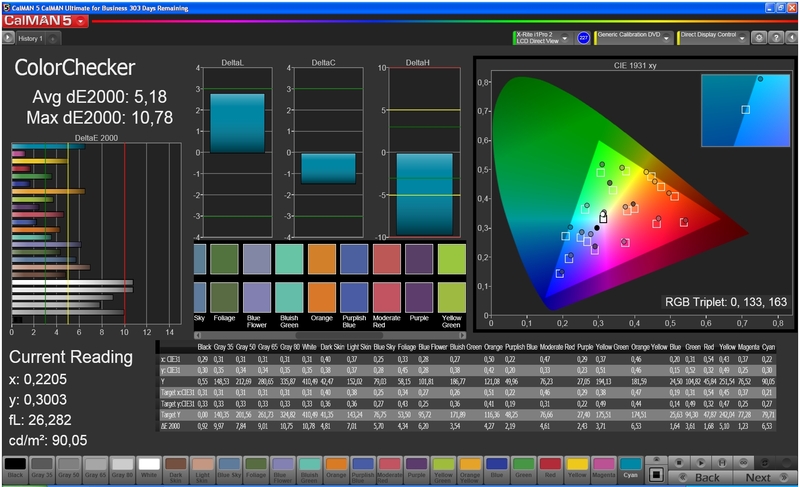 Apple's iPad Mini Retina is similarly bright with 398.4 cd/m², but the HP Slate 8 Pro 7600eg cannot quite keep up with 344.3 cd/m². However, all the other competitors are significantly brighter: The Samsung Galaxy Tab 3 7.0 SM-T210 with 426.6 cd/m² and the Lenovo S5000-F with 464.7 cd/m² are superior; Google's Nexus 7 2013 has the highest luminance with 513.4 cd/m². The measured results for the black value (0.57 cd/m²) and the contrast (749:1) are decent within the competition: The Tegra Note 7 is on the same level as the Apple iPad Mini Retina (0.54 cd/m²/761:1) and surpasses both the Google Nexus 7 2013 (1.07 cd/m²/513:1) and the Samsung Galaxy Tab 3 7.0 SM-T210 (0.81 cd/m²/548:1). Rivals like the Lenovo S5000-F with 0.44 cd/m²/1,082:1 and the HP Slate 8 Pro 7600eg (0.37 cd/m/986:1) can clearly take the lead. Subjectively, our review unit shows decently deep blacks during darker passages and a sharp picture. The Tegra Note 7 has interesting settings for the color correction, more precisely the presets Native mode and sRGB mode. It looks like these settings do not change a lot since the human eye can barely see a difference. 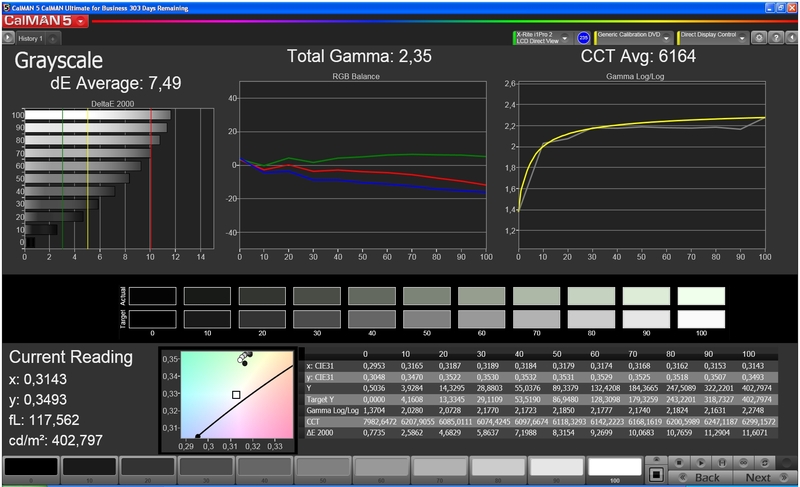 Our CalMAN measurements show that the Tegra Note 7 manages decent results in both picture modes. 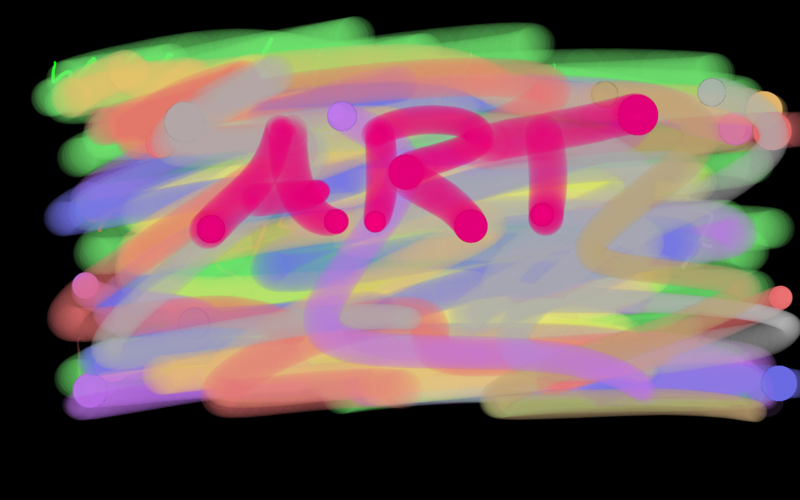 The color representation is slightly more accurate in the sRGB mode and the picture loses the red hue. ColorChecker determines a lower DeltaE deviation of 5.18 compared to 6.23 in the Native mode. The grayscale presentation shows a lower color temperature for the sRGB mode, but a slightly higher DeltaE value of 7.49 in return. 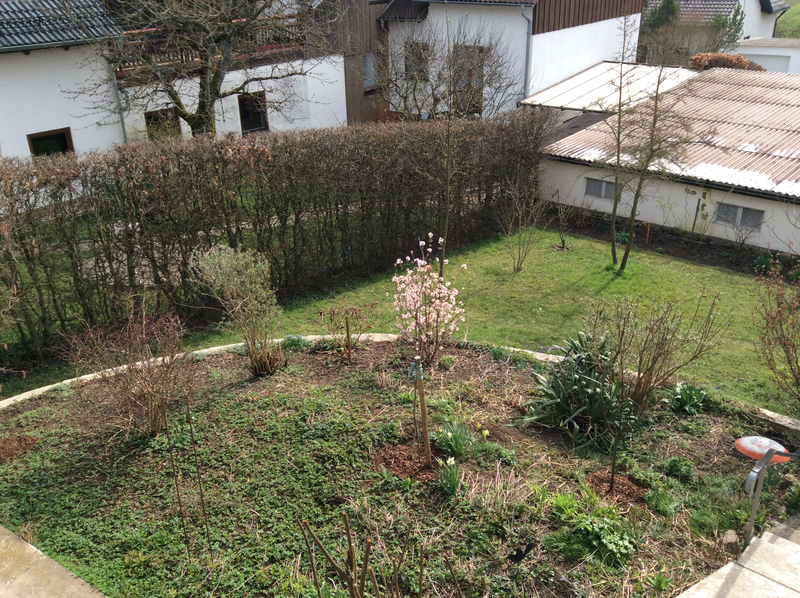 The saturation sweeps shows a significant deviation of blue (the situation is much better in the sRGB mode) as well as the color presentation itself in the Native mode. Overall, the sRGB mode offers good accuracy and the best compromise between color presentation, saturation and grayscale presentation. You can also use the two settings when you attach an external display via micro HDMI. 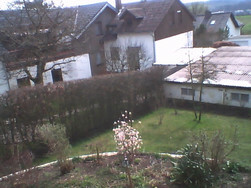 Thanks to the high maximum brightness of 427 cd/m², the Tegra Note 7 is well suited for outdoor use, at least in theory. 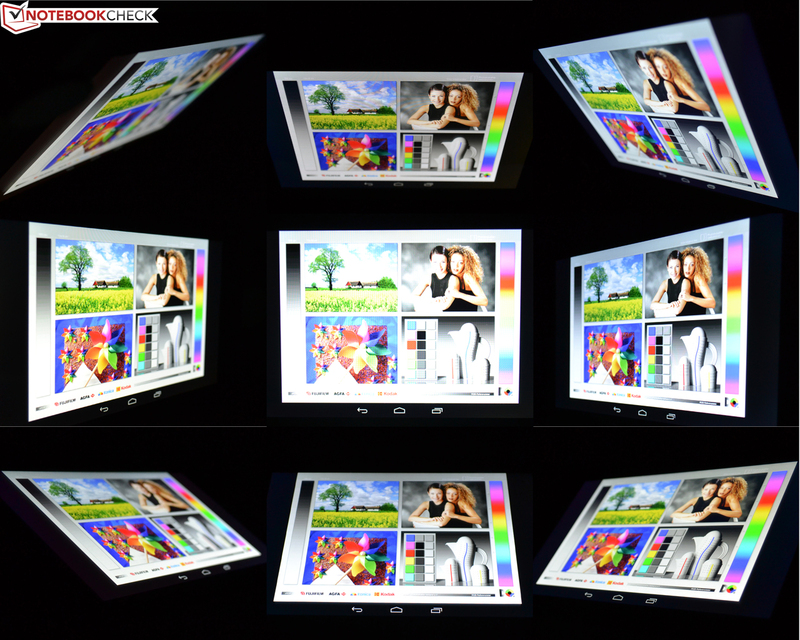 The glossy display surface, unfortunately prevents that as soon as you are under direct light. There are, however, no restrictions when you use the device in the half-shade. 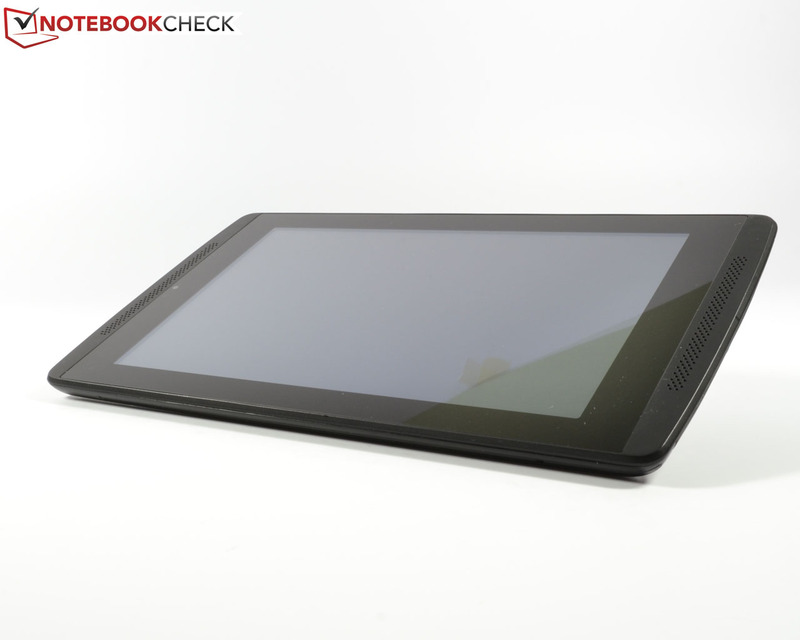 The viewing angle stability of the Tegra Note 7 is very good, due to the IPS technology. Especially outdoors, where reflections can be compensated with different viewing angles, you can see the benefits of the high-quality panel. We can only notice a slight brightness reduction with extreme and therefore impractical viewing angles. 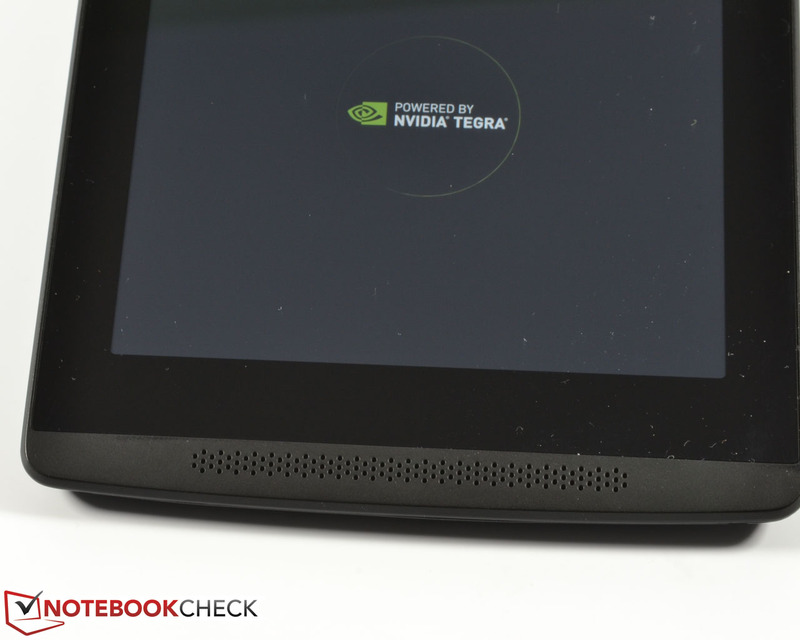 Nvidia obviously equips the Tegra Note 7 with one of its own processors; our review unit uses the currently fastest SoC from Nvidia, a Tegra 4 clocked at 1.8 GHz with an integrated GeForce GPU. 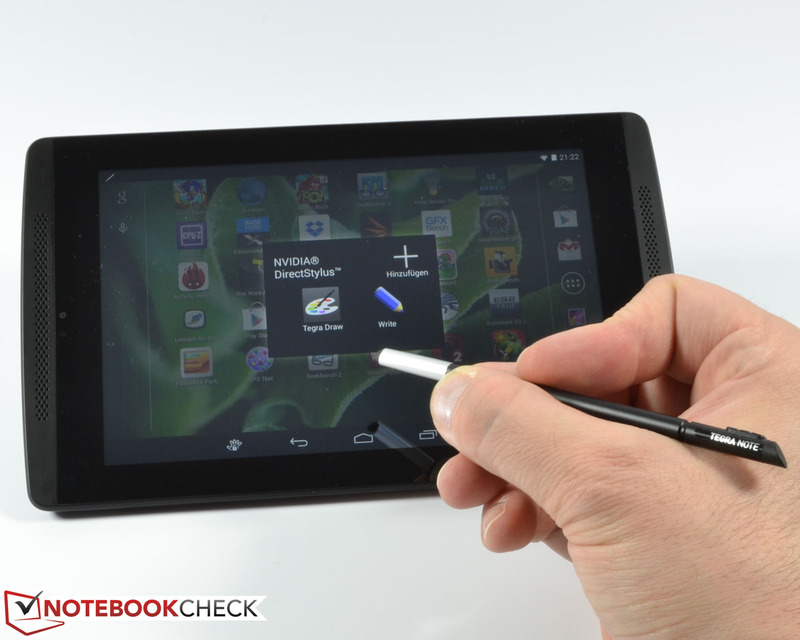 The Tegra Note 7 is therefore a very well equipped tablet for around 200 Euros (~$274). The performance of our review unit is also apparent in the synthetic benchmarks: 2,992 points in Geekbench 2 are slightly ahead of the already very powerful Google Nexus 7, and the rest of the competition is far behind. The newer Geekbench 3 could not be started even after a new installation and several repeated attempts. GFXBench 2.7 only shows the Apple iPad Mini Retina ahead of our review unit, all the other rivals are surpassed by 16% (Google Nexus 7) up to 87% (Samsung Galaxy Tab 3 7.0 SM-T210). The more demanding GFXBench 3.0 did not work on the device. We can see an even bigger advantage in Linpack for Android – up to 97% is impressive, and the Tegra Note 7 is on the same level as the Apple iPad Mini Retina. It is interesting that the HP Slate 8 Pro 7600eg is slower, despite the similar SoC. However, the HP Slate 8 Pro 7600eg and the other rivals can beat the Tegra Note 7 in 3DMark Ice Storm, only the Lenovo S5000-F falls behind. The Tegra Note 7 manages an excellent result in the AndroBench 3 storage benchmark; it looks like Nvidia integrated a fast storage module. Only the Lenovo S5000-F can roughly keep up with the performance. The results are even more drastic in the browser-based benchmarks: Our review unit can actually beat the previous leader Apple iPad Mini Retina in Google Octane V2, but Sunspider 1.0 and Peacekeeper still show an advantage for the iPad. The situation slightly changes in the two benchmarks Browsermark 2.0 and WebXPRT 2013. The Google Nexus 7, Apple iPad Mini Retina as well as the HP Slate 8 Pro 7600eg pull ahead in the former, and the HP Slate 8 Pro 7600eg as well as the Lenovo S5000-F are also faster in the latter. 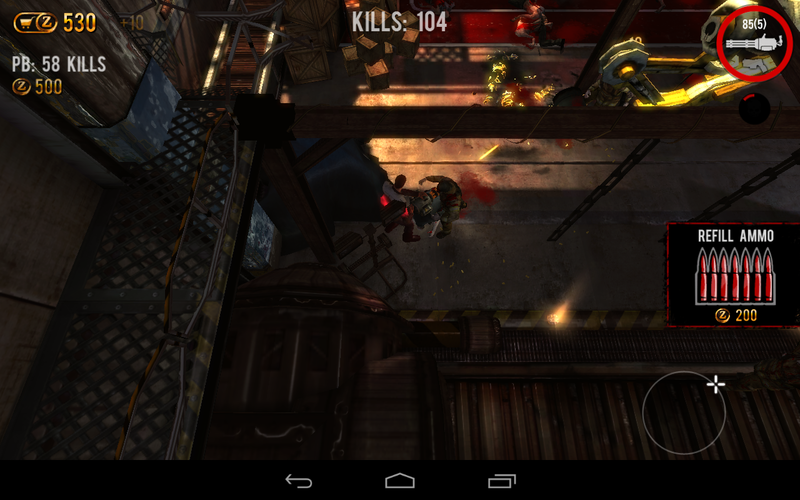 Nonetheless, a very good result for the Tegra Note 7. The Nvidia GeForce graphics solution, which is integrated into the Nvidia Tegra 4 SoC, can convince us as well. We tested some current games from the TegraZone called game hub. The Zombie action games Dead Trigger 2 and Dead on Arrival 2 are just as smooth as the Tower Defense game Green Eden. These are specifically optimized versions for the Tegra SoC with blur and depth effects, shadows, HDR lighting effects as well as a complex and detailed environment. 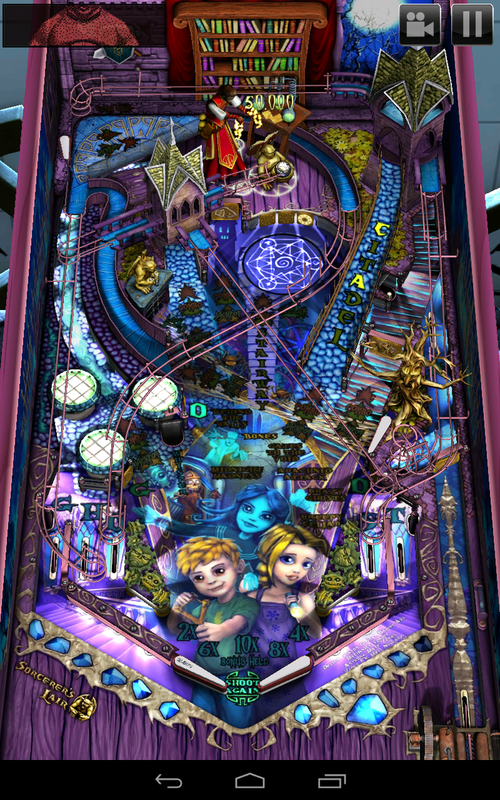 Standard games like Zen Pinball HD or the fast Sonic Dash do not show dropped frames, either. The input combination of touchscreen, position sensors and accelerometer works very well and enable precise control with quick execution. 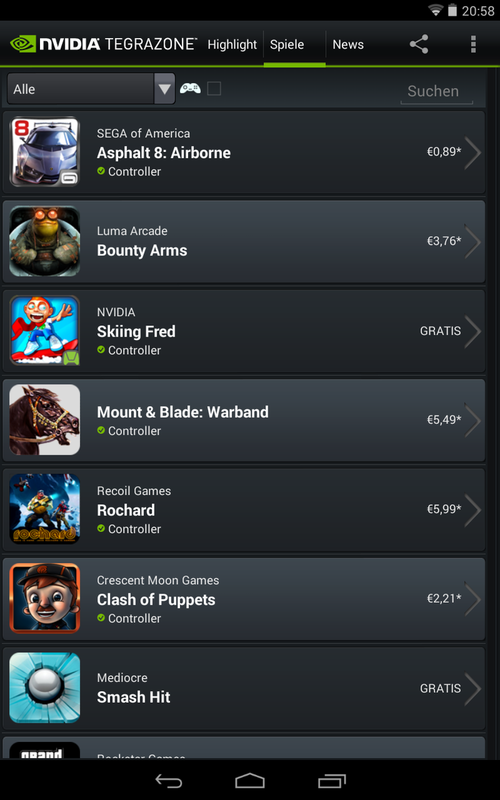 Compatible Bluetooth gamepads are supported as well. 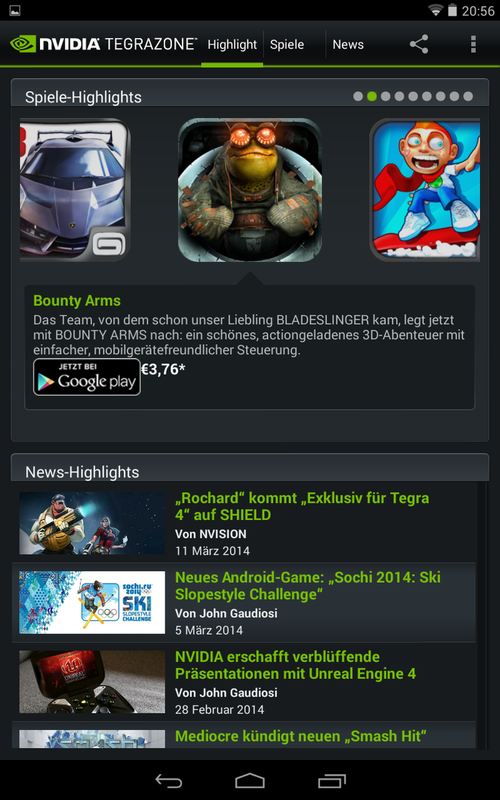 ...that shows optimized games from the Play Store. Surface temperatures of the Nvidia Tegra Note 7 are always in the acceptable range. The tablet warms up to an average of 30.2 °C (86.4 °F) at the top and 28.4 °C (83.1 °F) at the bottom during idle with a maximum temperature of around 33 °C (91.4 °F). Even during the stress test for the Tegra 4 SoC, which is simulated by the app Stability Test for around one hour, we can only measure average temperatures of up to 39.9 °C (103.8 °F) at the top and 36.6 °C (97.9 °F) at the bottom. The hottest point is at the top with 46.8 °C (116.2 °F). (-) The average temperature for the upper side under maximal load is 39.9 °C / 104 F, compared to the average of 30.7 °C / 87 F for the devices in the class Tablet. The stereo speakers at the front produce a very good sound. It can get a bit tinny and focused on high tones with very high volumes, but it is still one of the best sound experiences within the competition. There is even some bass. The clever position of the speakers at the front does not hurt, either. There is obviously no real stereo sound because of the small distance between the two speakers, but the sound is still rich. External speakers can be attached via a 3.5 mm stereo jack; it enables a high maximum volume with a slight background noise. We can see mixed results in the power consumption. 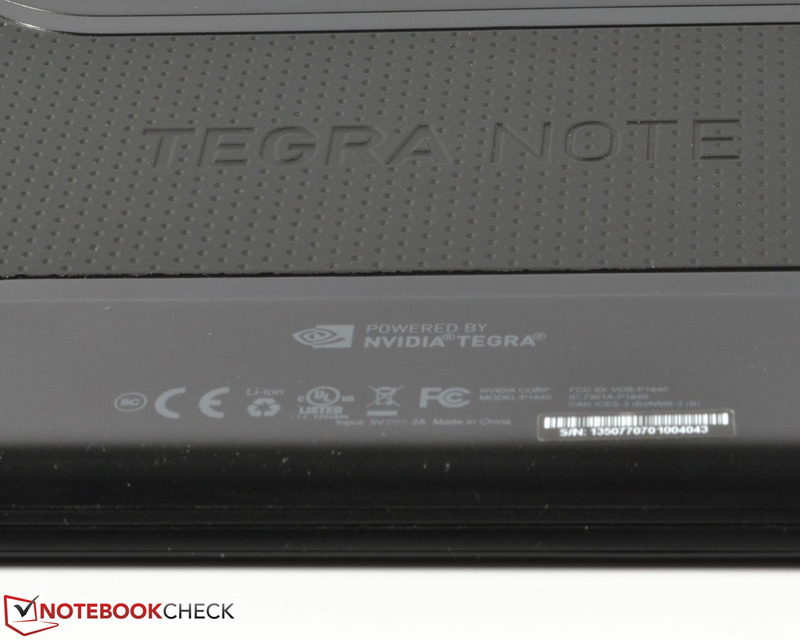 The Tegra Note 7 only needs 1 Watt during idle, but this value is raised up to 3.8 Watts during light workloads. All in all, an average result within the competition. Maximum load for the review unit results in values between 8.9 and 10.7 Watts from the socket, which is significantly more than the competition. Even the faster Apple iPad Mini Retina is more frugal with up to 8.3 Watts; only the HP Slate 8 Pro 7600eg, which uses the Tegra 4 SoC as well, uses more energy. The consumption is still acceptable when you consider the high performance. GFXBench 3.0, stable performance of 1658 points (29.6 fps) over the 30 min span and a calculated runtime of 180 min. 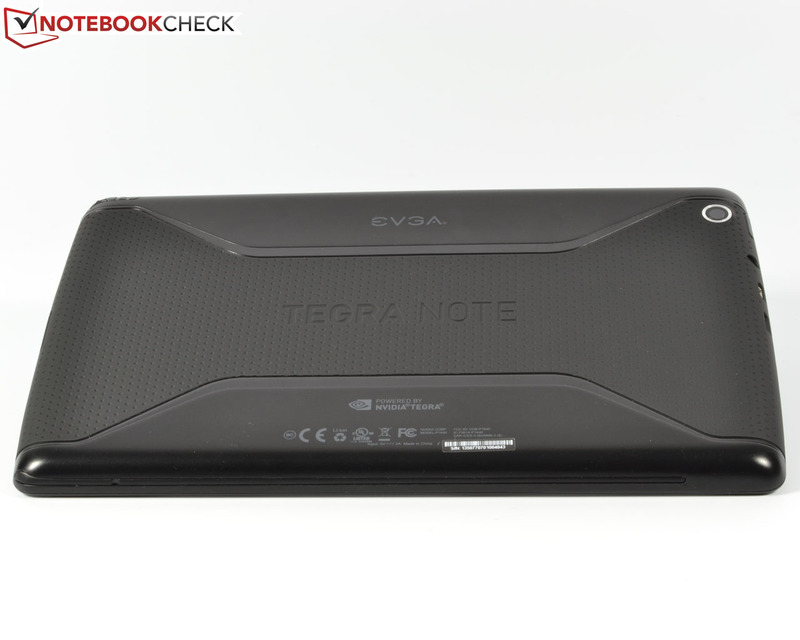 Nvidia equips the Tegra Note 7 with a 15.17 Wh/4,100 mAh lithium-ion battery. According to the manufacturer, this should be sufficient for 10 hours of HD movie playback. Our battery tests leave a mixed impression: The maximum battery runtime is determined with minimum display brightness and activated energy-saving settings (no display time out). The tablet manages 19 hours and 45 minutes, which is similar to the Apple iPad Mini Retina (23.8 Wh), the Lenovo S5000-F (3,450 mAh) or the HP Slate 8 Pro 7600eg (21 Wh). Samsung's Galaxy Tab 3 7.0 SM-T210 (14.73 Wh/4,000 mAh) only lasts 11 hours and 45 minutes, Google's Nexus 7 2013 (16 Wh/3,950 mAh) on the other hand runs for more than 44 hours. The other extreme scenario is simulated by the app Stability Test, which stresses the CPU and the GPU at the maximum display brightness. The battery of our review unit has to be recharged after just 2 hours and 20 minutes. All the rivals are more enduring with runtimes between 3 and 4.5 hours. Our more realistic WLAN test uses an adjusted display brightness of 150 cd/m² (around 40%) while a script refreshes web sites. 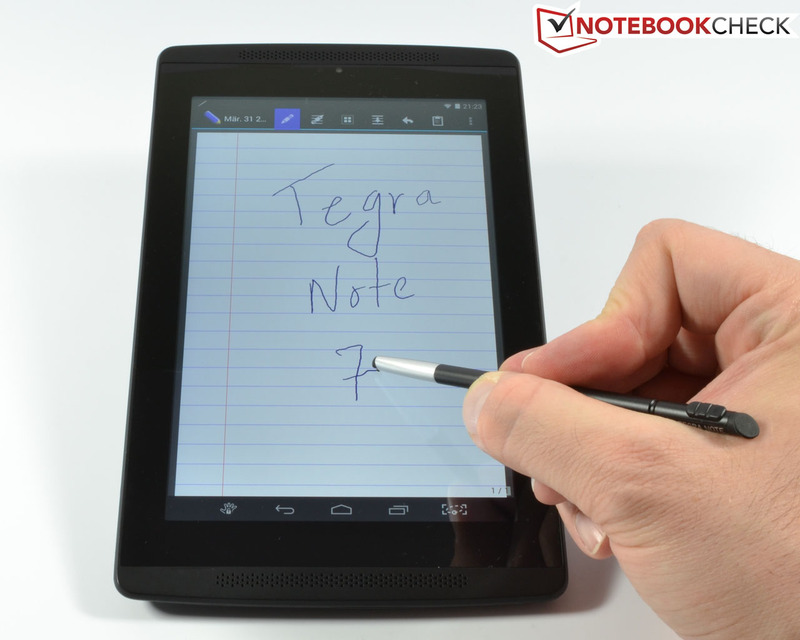 The result is a runtime of 6 hours and 25 minutes for the Tegra Note 7, which is similar to the Google Nexus 7 2013 and the Samsung Galaxy Tab 3 7.0 SM-T210. Other rivals, however, last much longer. 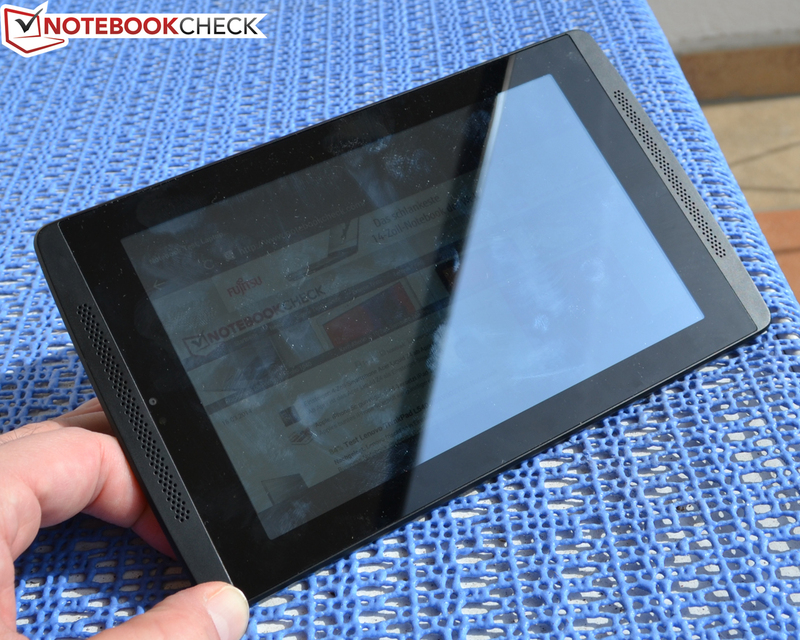 The Lenovo S5000-F and Apple iPad Mini Retina manage between 9 and around 15.5 hours. The advertised runtime of 10 hours during movie playback sounds realistic, at least as long as you activate the energy-saving features and do not use the maximum display brightness. 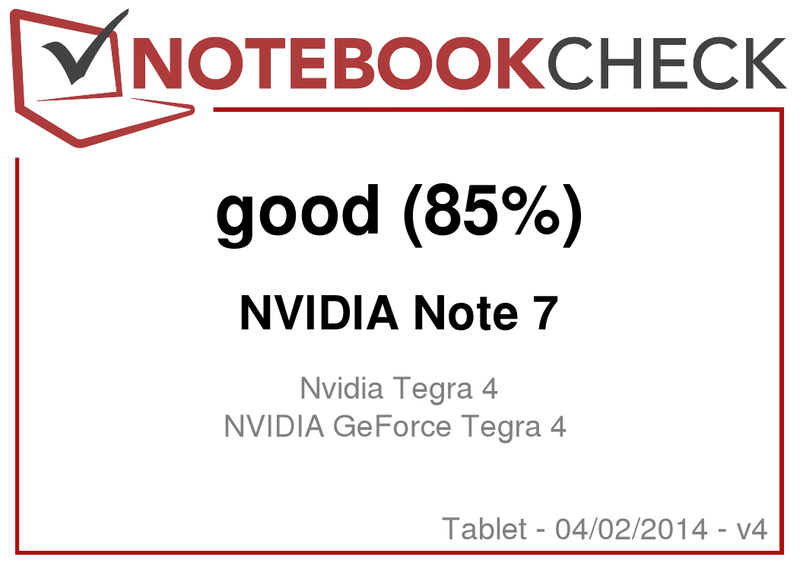 Overall, a decent performance of the Nvidia Tegra Note 7. 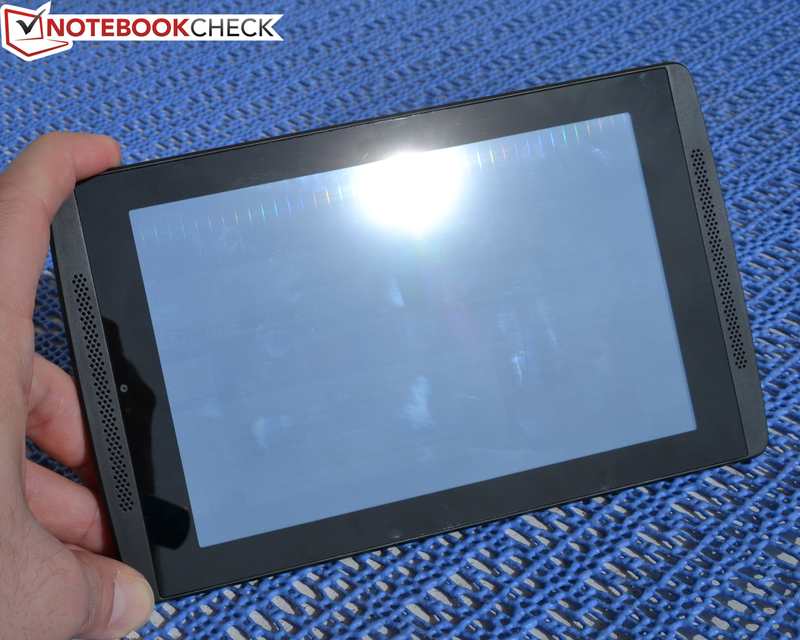 Nvidia wants to compete in the tablet market with the Tegra Note 7. 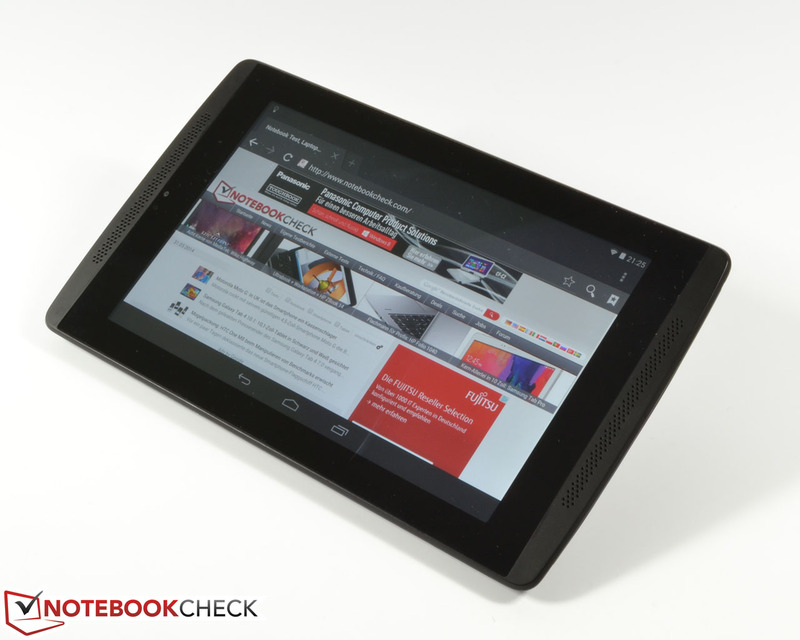 An RRP of 209 Euros (~$287) means that it has to face the very good Google Nexus 7, but it cannot take the top position. The much more expensive Apple iPad Mini Retina is also on a completely different level. However, the review unit can surpass the rest of the competition, but why is that? 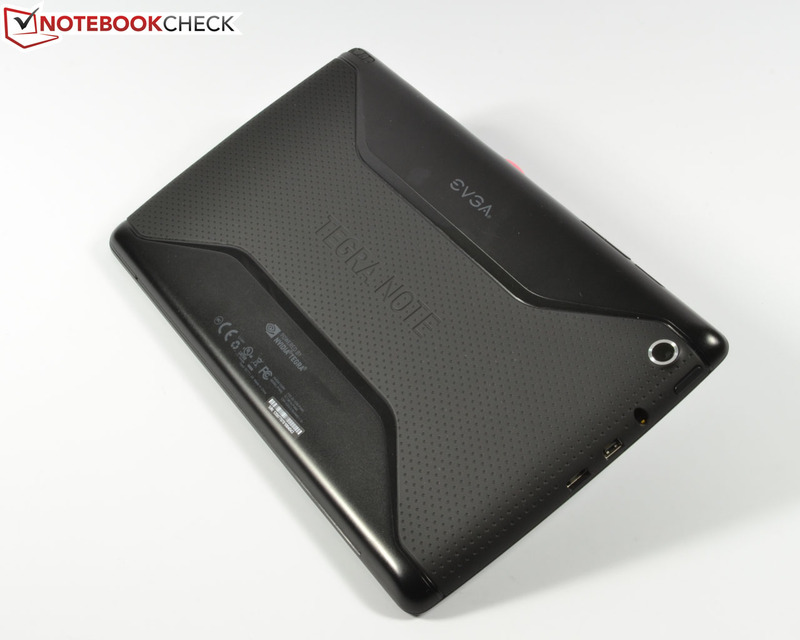 In Review: Nvidia Tegra Note 7, courtesy of: EVGA. 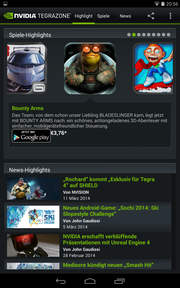 In Germany, the Nvidia Tegra 7 is offered by Gigabyte and EVGA. 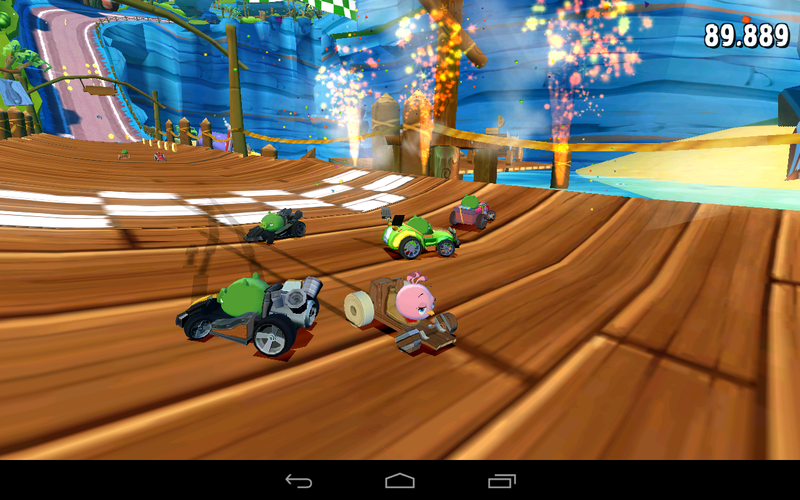 ...powered by an Nvidia Tegra 4 SoC. 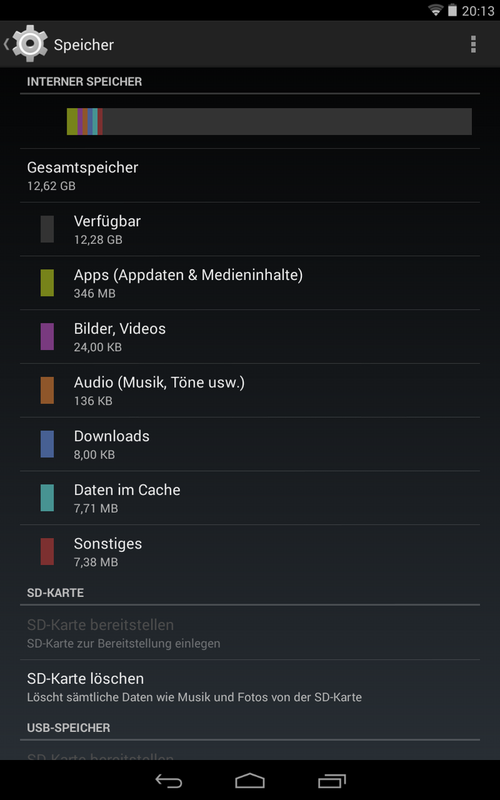 You can use around 11.91 GB from the 16 GB storage. Nvidia Tegra Zone is Nvidia's game hub. 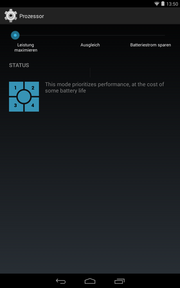 The Android settings of our review unit have some additional options like DirectStylus and energy-saving features. 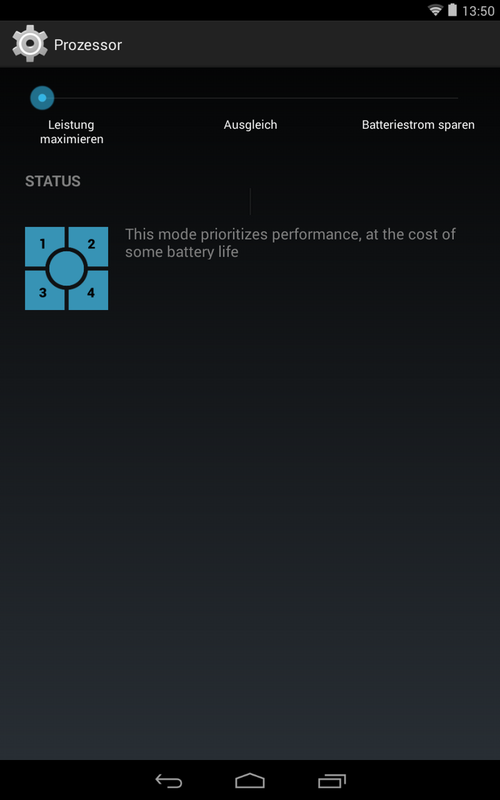 There is also an energy-saving menu to increase the battery runtimes. 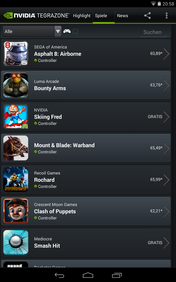 Some gamepads are supported as well. Biggest unique feature: the provided DirectStylus. 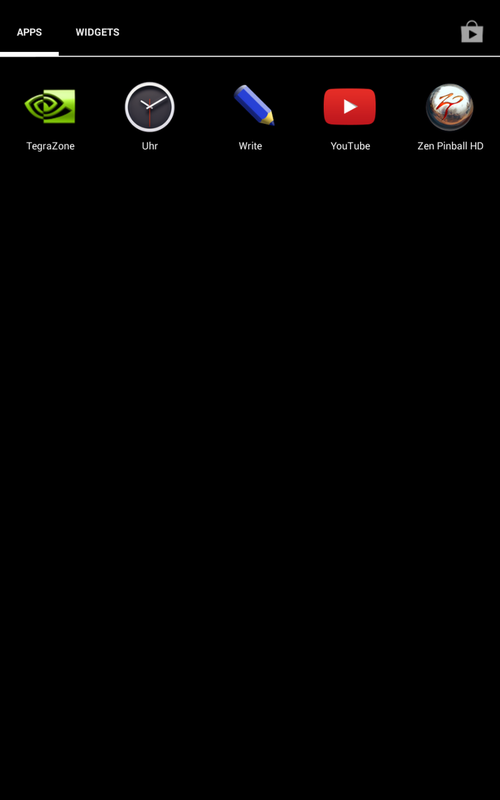 ...and a customizable menu appears. You also get the app Write for notes. 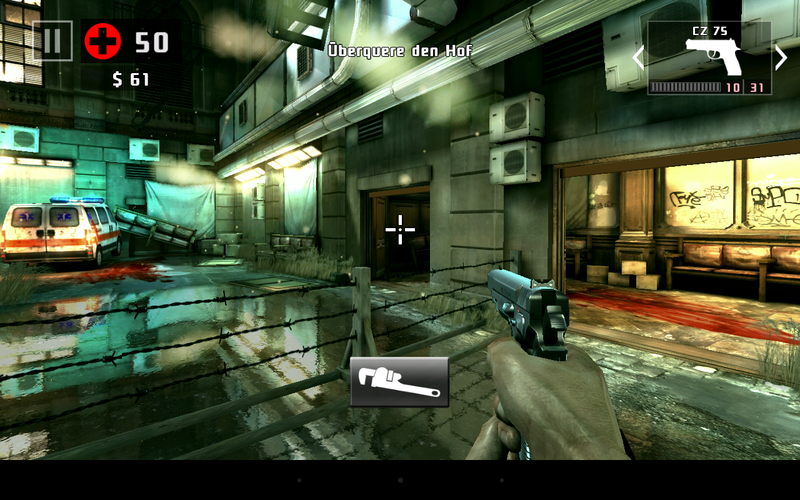 Operating the device with the stylus works really well. ...can convince us with convenient haptics and a good design. ...the main camera are very convincing. The tablet supports micro SD cards with a capacity of up to 64 GB. The high performance and the stereo speakers at the front. A lower price since the performance is "only" on the same level as the less expensive Google Nexus 7.